By Bianca Moragne You’ve heard it before: mother knows best. An Austin mother’s simple invention might just prove that saying correct and even contribute to the fight against breast cancer. 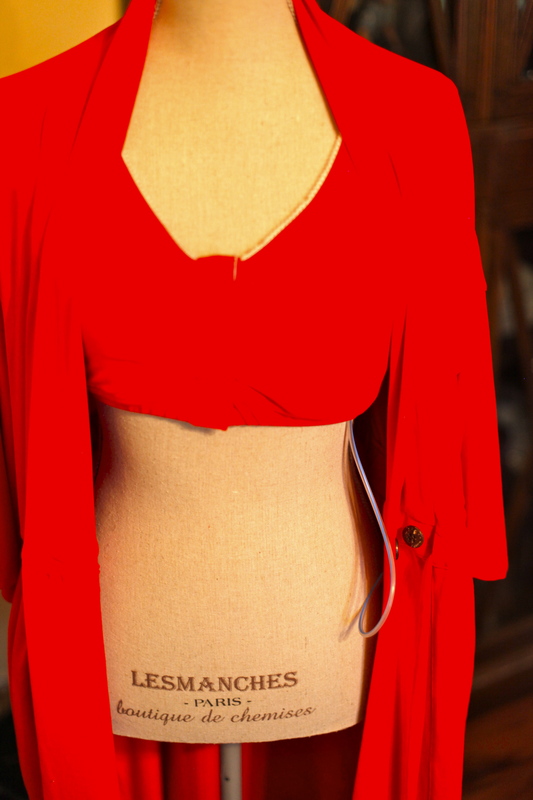 Allison Schickel invented “The Brobe”—a unique robe with a built-in bra that offers relief from the discomforts that breast cancer surgery brings to patients and survivors. In 2010, Schickel decided to start pursuing her idea. The same year she contacted a local seamstress with her idea. It took three months to design the Recovery Brobe, which launched her company. With a couple of prototypes in hand, Schickel contacted Komen Austin, who brought a breast cancer patient in to try on all the Brobes. “She tried them all on and turned, with tears in her eyes saying, ‘you absolutely have to do this, it makes me sad for all the women who haven’t had this in years past.’ I said OK,” Schickel recalls. After learning about the trials of having a double mastectomy and three reconstructive surgeries from a close friend, Schickel took it upon herself to make women affected by the deadly disease feel beautiful again. Schickel has committed to donating 10 percent of all Brobe proceeds to Komen Austin. In May 2012, Schickel and Komen Austin put on a mother-daughter brunch and fundraiser, “Bubbles & Brobes,” to raise awareness for breast cancer and launch the Brobe. 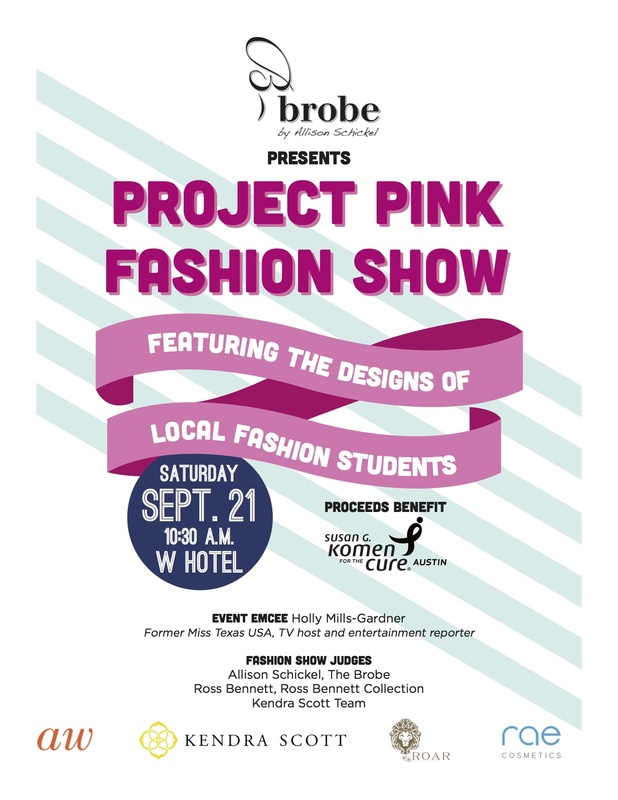 In celebration of Komen Austin’s 15th year, Schickel has partnered with them to sponsor the “Project Pink Fashion Show” that will take place Sept. 21, 2013 at the W Hotel. Fashion students from the University of Texas, Baylor and Texas State interested in getting exposure in design, will create one-of-a-kind looks that are inspired by breast cancer patients and survivors out of extra Race For The Cure marathon T-shirts. Other materials may be used to create the outfit but a T-shirt must be used. Breast cancer survivors will be the models. Allison Schickel, Kendra Scott and Ross Bennett, a clothing designer and former Fashion Star contestant, will judge the fashion show. The winner will receive a one-on-one entrepreneurial meeting with each judge. “My dream is to make the Brobe as big as Sara Blakely has with Spanx. I want to be able to manufacture and distribute here in Austin and create undergarments, pajamas and make the Brobe a brand, not just a business,” Schickel says. Schickel’s compassion has helped women move towards recovery even after the scars have faded, Youngblood says. She hopes more will follow her lead.